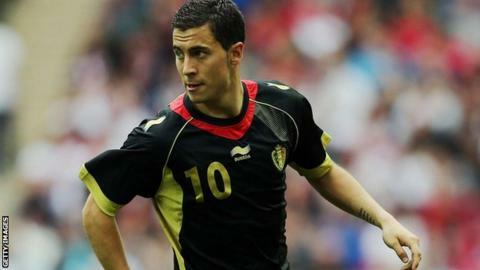 Eden Hazard has declared it is "now or never" for his Belgium team ahead of their 2014 World Cup qualifier against Wales in Cardiff. The 21-year-old Belgian midfielder, who signed for Chelsea for £32m from Lille in June, has made an immediate impact on his arrival in the Premier League. Belgium face Wales in Pool A on Friday and then host Croatia four days later. "For the country and fans, the next two games are really important," said Hazard. "With the squad we have now, we should be able to do something. In a way it's now or never for Belgium." Hazard, who has helped Chelsea win their opening three league games, is just one of a handful of Belgian stars plying their trade in the Premier League. It is a decade since the country last qualified for the World Cup or the European Championships, but expectations are high with players such as Arsenal's Thomas Vermaelen, Manchester City's Vincent Kompany, Everton's Marouane Fellaini and Hazard leading the way. A 4-2 friendly win over The Netherlands in August underlined their billing as Group A favourites, while Wales are searching for their first win and first goal under new manager Chris Coleman. Hazard feels he often fails to reproduce his best club form on the international stage, but stressed the players must now deliver under pressure when it matters. "We have a great generation but we have to do it on the pitch," said Hazard. "Perhaps I have not been as effective for Belgium as for Lille or Chelsea. Why that is I'm not sure. "Maybe expectations are too high. Maybe people expect me to score three goals per game." Belgium won 1-2 on their last visit to Cardiff 15 years ago, having lost their three previous visits to the Welsh capital. Coleman, who was on the bench in the last meeting between the sides in 1997, has great admiration for the current crop of players, while also retaining faith in his own players to deliver. "We know we're up against a tough, fancied Belgian team," he said. "They've got a lot of players playing in the Premier League, performing very well. But we're mindful of speaking too well of them, I'd prefer to speak about us. "We've got our own strengths and we've got something to offer in this group."